I actually finished this dress on Sunday, to wear to my aunt's for a dinner party. Almost last minute I realized that despite the lining, the dress could, in the "right" light become a "sun dress", as my husband used to call them. I wore something else, and the dress didn't come up from the basement till I made a full slip to wear underneath. This is Vogue 2238, which is now OOP. Guess I'm really behind the times, because it's not even on the Vogue website. I did find someone's image at some point - sorry - didn't make note of where it came from. Did make some changes. Rounded the neckline, flattened the bust (OK - officially - SBA). I suppose, it's mostly view G, which is the brownish one above the red, but I gave it the 3/4 sleeves. The fabric is a very fine plain weave wool in - obviously - oatmeal. (Sounds way better than boring neutral beige.) I'm no fan of oatmeal as food, but as a colour I think it has great versatility. Just think of all the colours I could put with it to dress it up. Jackets work over top, as do cardigans, or it can go solo with various scarves and necklaces. Except for the bust, the rest of the fit was perfect - a little too perfect. I ended up letting out the side seams from the midriff down by 1/8 inch (1/2 inch total). I do like to be able to breathe without feeling as though something is squeezing me. Just under the midriff seam and at the sleeve edges I added some "ribbons" made of the same fabric. Added a half knot at centre front. Crazy - I handstitched all of this in place. Just liked the way that looked, and I didn't want to deal with having something go wrong while attempting to stitch this on the sewing machine. I finally found a use for the presser bars that I had acquired quite some time ago with all sorts of ideas of putting Celtic knots on the backs of jackets. That didn't happen, but I now I was able to make perfectly straight and even strips of wool fabric. No scraps of this wool left - I had just enough to cut the dress, and barely enough to make the trim. Needless to say, there was no way I could make a pleat in the back, so I did end up with a slit, which I topped with a crow's foot to keep the top of the slit safe from ripping. Working on my last pair of corduroy pants - the 4th. Won't bore anyone with any more multiples of the same item. Thinking of what my next project should be - I would like to get in one more wool dress - it'll probably come in handy all the way till at least then end of April. Or should I pack all the woolies away till after the summer and tackle some lighter fabrics? It has finally warmed up a little around here, though it's really still too cold to contemplate "light dressing". Thank-you Rosy! To-day I received some sunshine in the mail - in a yellow envelope, no less. In it were the lovely things that I won over at Rosy's blog. That really put a smile on my face - just what I needed after dealing with yet more snowdrifts in the driveway yesterday and to-day. Rosy - you also helped me to make the decision on what to wear to a wedding that I'm going to at the end of the month. That hair bow is just the perfect accessory for one outfit that I was contemplating. Thank-you so very, very much! I never thought that I would come to this, but I am so sick of sewing knits! I've been making up the samples for classes, as I mentioned. While I was at it, I thought that it would be a good idea to try out the various necklines that come in the package for neckline options. Who knows which neckline a student will pick, and, well, I have to be ready. And while we're at it - who knows what sorts of fabric those students will choose, so let's try different fabrics, to see if there are any problems that could be averted. Get the picture? So now I have various t-shirts in various stages of construction. Only three were actually finished and taken to the store to hang up for open house tomorrow. The rest are languishing as UFO's for the time being, and I promise not to let them languish for too, too long, but I really do need a break from monotonous sewing. Here, then are the pieces that went to the store. Pictures were snapped in a hurry on my way out the door. Turns out, that the best place for indoor picture-taking is in the living room, with the big window. Unfortunately, it is also one of the rooms that at present is in a rather shabby state, awaiting a paint job in the, hopefully, not-too-distant future. So - please ignore the strange line above the baseboard - that's what happens when you rip out carpeting and the baseboards sink a bit, as well as other odd things that I didn't manage to crop out of the pictures. This is the boat-neck option (though I do prefer calling it a bateau-neck - sounds so much more elegant). It's a rather fine sweater knit. Rather a pain to sew, just because the skin on my fingers has become so rough, and I kept snagging on the fabric. No real damage done. Hmm - I do have a piece of fake suede in dark red that should become a skirt to wear with this. Last, but not least - my wild side - with a funnel neck. The patterns used were: Pamela's Patterns #104 The Perfect T-shirt and #107 New Necklines and sleeves for the Perfect T-shirt. Sorry, Pamela I guess I don't have a "REAL" figure, because I had to do quite a lot of tweaking to get this pattern to fit me. It was just way too big, even in the x-small. I do love all the neckline options. And now that I've fiddled and fiddled - I have a master pattern for t-shirts that I can just pop down on fabric, cut and sew. I'm sure that most people won't have this problem, because most people, it seems, come in slightly larger sizes than I do. 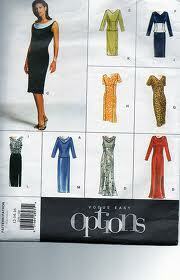 Oh - the pattern has a shaped hem, which I left on for the funnel-neck, but which I straightened for the bateau. What will I make next? So many choices... Guess I'll have to just make a decision and stick to it.